Sagging Ceilings and Bouncy Floors? Check Your Joists Now! A ceiling that sags in the middle or a floor that is uneven might be a part of an old home’s charm. Or it could be a sign of a serious problem. Those of us who live in older homes often take delight in their unique characteristics. Rooms are not quite square, doors are an unusual size and even the floors, walls and ceilings might look as if they were designed in the days before straight lines were invented. That is OK as far as it goes, but sometimes a structural defect can be dismissed as just a part of an old house’s charm – and with potentially catastrophic consequences. If something is not right with the floor or ceiling, it is likely to be caused by the wooden joists, that could easily be a hundred years old or more, needing attention. Caught quickly, they might need nothing more than some timber treatment services, and they will be good to carry on for years to come. The point is that you will not know unless you check. Here’s how. Floor joists are the wooden beams that are used to support the floor on each level of your home. At ground level, they are attached to the bearers that stick out of the ground. Upstairs, there is another set of joists that support the floor above and the ceiling below, and finally, in the loft space, you will have the top level of joists, to which the upstairs ceiling is attached and, if fitted, the flooring in the loft. Given the important role that they play in your home’s structure, the potential consequences of joists giving out entirely hardly bear thinking about. The fact that the house has a whole row of them means that if one breaks, the surrounding ones will take the additional load, and all you will notice will be that springiness to the floor or a slight sag in the ceiling. The problem is that if one is weak, the rest are likely to be in a similar condition, and with the additional load placed on them, a ripple effect could result in a matter of weeks. In the worst case, you might suddenly face a catastrophic collapse of your ceiling, floor or both. 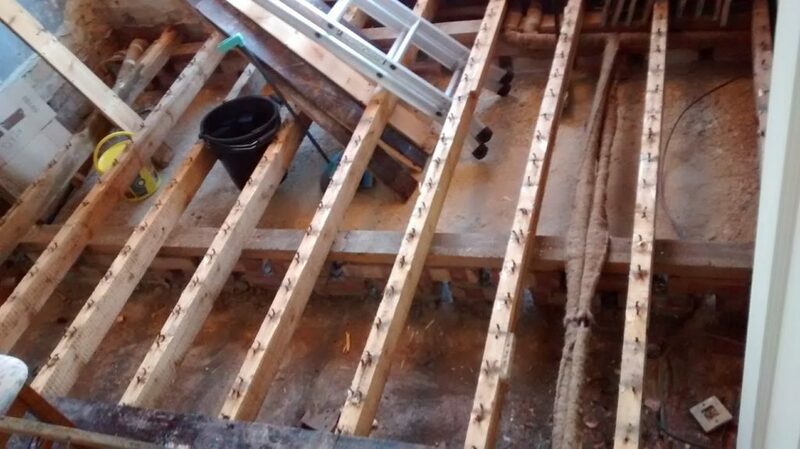 The easiest joists to check are usually the roof ones, as most homes still have them exposed and accessible from the loft space. Examine the joists carefully for signs of wear, rot or damage. On lower levels, you will need to lift the floor covering and raise a floorboard or two in the affected area to find out what has caused the problem. Caught early, it is not a major job to repair or even replace damaged joists. If rot is the problem, you can often solve it by replacing the one that is broken and getting the rest treated to prevent them from going the same way. It is certainly quicker, cheaper and less dangerous than a collapsed ceiling, so if in doubt, check them out without delay! Published January 29th, 2018; edited April 12th, 2018.